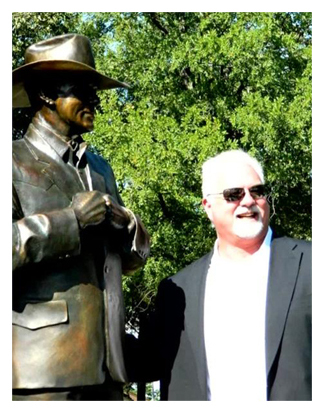 The memory of Weatherford’s favorite son, Larry Hagman, was immortalized on Sunday, Sept. 21, when a statue of the late actor was unveiled at the Doss Heritage and Culture Center. Hagman’s daughter, Kristina and son Preston, his sister, Heller and niece Dana Hagman pulled the cover from the full-length bronze statue. Talk of honoring Hagman’s memory began with a group of citizens as they returned from his funeral nearly two years ago. Two committees were formed to address questions including where the statue would be located and what would be necessary to have it built. 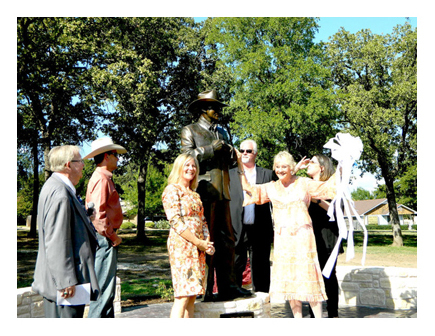 The Larry Hagman Memorial Committee and the Civic Development Board both worked to make the statue a reality. 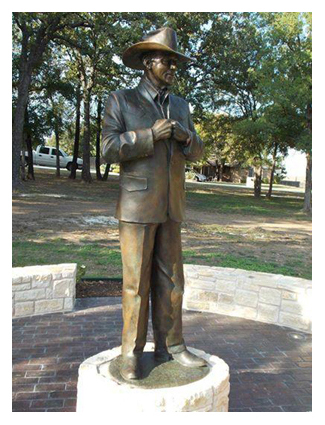 Organizers decided that the statue would be located at the Doss Center and Warner Brothers approved the use of a photo of Hagman to be used for the statue. During the ceremony, family members and special guests spoke about the effort it took to take the concept of the statue and make it a reality. Several thanked those who had contributed funds to have the statue built. Retired U.S. Congressman Jim Wright also spoke, recalling how the actor hated cigarette smoke. “He wanted everyone to quit smoking. If someone had a cigarette, he would reach into his pocket and pull a fan out, and point it at the smoker,” said Wright with a chuckle. Family members surround the newly unveiled statue of actor Larry Hagman. TNT is toasting the late Larry Hagman and the ruthless Texas oil tycoon he played on nighttime soap “Dallas” with J.R. Ewing Bourbon. Bourbon was the character’s drink of choice. 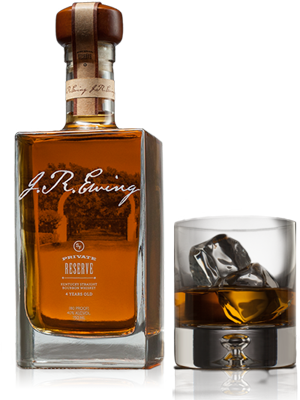 The four-year-old, 80-proof J.R. Ewing Bourbon is distilled in Kentucky and features a slightly fruity nose with hints of vanilla, oak sweetness and a touch of orange. Bottle comes with a wooden stopper and a screen-printed image of the show’s iconic Southfork Ranch, home of the Ewings. The new brand of bourbon will initially launch in 14 states across the South and Midwest at the end of March to coincide with the third-season premiere of “Dallas” on Feb. 24. It will roll out nationwide in the following months and be made available for sale overseas by the end of the year. “It’s exciting to have the show and J.R.’s legacy represented to the public in a new way,” said Dallas executive producer and writer Cynthia Cidre. Warner Bros. Consumer Products and Warner Bros. Television Group are producing the licensed product with Southfork Bottling Co. and Glazer’s Inc., one of the nation’s largest wine and spirits distributors. Prairie Creek Beverages will market the bourbon to distributors around the U.S., while Melchers Group, a Dutch exporter, will handle marketing duties in international territories. “Creating a brand of such high quality is reflective of J.R.’s thirst for the best in life, and the new brand really pays tribute to the character with whom everyone around the world is familiar,” said Andy Harmon, co-founder of Southfork Bottling Co.
Click Here to find a location near you to purchase J.R. Ewing Bourbon.